Hi everyone. I'm so happy you came to visit my garden today. I've found blogging a wonderful way to journal the progress of my garden during the year. Last month in early May the roses were blooming and my artichokes were ready to pick. This month the Canna Lilies are growing tall, and the Day Lilies are blooming every day. I decided not to pick the artichokes to eat, and let them bloom. They have such beautiful colored blossoms. And a beautiful sight to see. The Oregano is a great ground cover. It's the lighter green plant behind the little angel. The roses next to the fence have stopped blooming until later in the summer. The climbers - Don Juan and Joesph's Coat will bloom one more time this year. My lavender plant is ready to harvest. I'm so excited to have such a prolific plant. I have lots of ideas for the lavender buds. Stay tuned!!! My angel is always watching over My Cozy Corner. She is standing in front of my only grape vine. walk over to the patio and eat a whole cluster. This rose was just watered with the sprinkler and the petals are kissed with water drops. Just a little snippet of the garden in June. I'm joining some wonderful blogger friends and their inspirational blogs. HI Betty! Your garden and plants are so pretty! Everything looks so healthy and lush. That's a cute idea putting the gazing ball in your bird bath. Happy 4th to you. Lovely garden - we just love those gardens don't we! My garden is one of my favorite places and I am always anxious for summer when I have time to just play there. I am a teacher and volleyball coach so my garden suffers during the school year. Your garden reminds me of some parts of mine, but I have no grass - just cobble stone. Thank you for the wonderful visit in your beautiful garden. You have a gorgeous garden! Any suggestions for something to layer behind my daylillies? I need something a little tall that likes lots of sun. THanks! 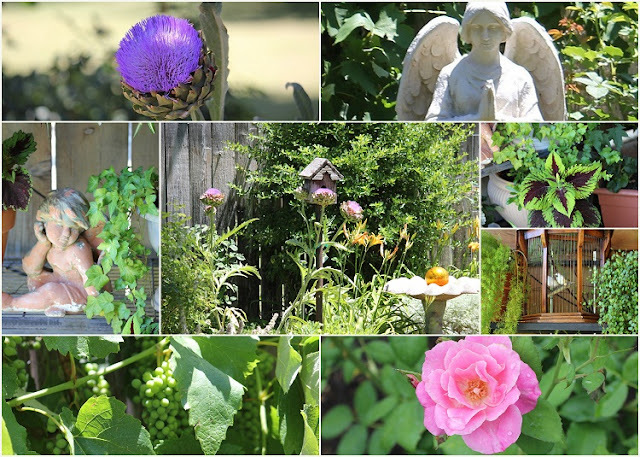 Hi Betty: Just super pictures--I love your artichoke flowers--deep purple is a favorite garden color of mine! Thank you for sharing it all with us. Take care, and have a wonderful weekend! your garden is so lovely. thanks for showing us your work. Seriously....how do you manage to maintain such a pristine garden??????? Everything is just so neatly cast and perfectly aligned! And your grapes....what a joy! Reminds me of when I was growing up. We had a small grape orchard on the west side of our home, and it was always the best thing!!! My Mom would make homemade jams & jellies & juice (and perhaps a little wine!). Great memories!!! I think I will try to plant some of those artichoke flowers and see what happens. I'm also thinking now that I'd like to try my hand at lavender on a small mound on the south end of the back yard. It gets lots of sunshine, so it should work. I'm not the world's greatest gardener...even though I do try! This is really beautiful!!! Hi Betty, Just want to say your garden is looking so lovely! I love all the flowers and I just wished they all stayed the whole season. Sure would be beautiful to see! Your birdbath that is holding your gazing ballis one of my favorite styles..love the fold over leaf design. I had one but it was broke putting it away one fall day! So pretty! Your garden is so lush and beautiful. I've never seen an artichoke bloom. So pretty. Betty, The artichokes are amazing and your rose pretty. I like your angel and your birdbath with the gazing ball. Lovely garden, Betty! Beautiful garden, Betty, looks like everyone is loving it and perfect images too. Your garden is beautiful. I can't get over the artichokes - they are great. I never saw one before. Betty, your sweet garden spots are inspiring me to spend some time in my yard and on my patio this weekend really working to get mine in shape. Thanks for sharing the beauty with us. I'm your new follower and hope you'll stop over to Quirky Vistas for a visit as well. Your garden is so neat and well-maintained, very calming. I love the shots of the grapes and collage! you have a lovely and amazing garden. There is NO way I could have let the artichokes go to blossoms though, love to eat them far too much, ha ha. Miss our grapes fines from our old house, had them growing alongside the house and the kids loved being able to pick fresh grapes to pop into their mouths for a quick treat. Hope you enjoy your garden the rest of the summer and have a fun Pink Saturday! I enjoyed visiting and the grand tour of your garden. Your work has paid off. The angel is perfectly placed to watch over all that beauty of God! I love the artichoke flowers - just stunning! Happy Pink Saturday and have a blessed weekend. Such a beautiful garden. Love the grapes!!! Thanks for bringing your garden to Seasonal Sundays. WOW! I have never seen an artichoke bloom before! Stunning! Lovely gardens! Your garden is absolutely gorgeous, Betty! I think it's quite fantastic you grow grapes, too. I found your blog through the Home & Garden Thursday party at A Delightsome Life, and I'm looking forward to reading more about your garden and travels to the UK. I went to England and Scotland in March for the first time and I'm in love. Your garden is beautiful!!! love the artichoke bloom! Just found you and now following.